Marshall, Tabitha. "Harry Jerome". The Canadian Encyclopedia, 17 January 2019, Historica Canada. https://www.thecanadianencyclopedia.ca/en/article/harry-jerome. Accessed 23 April 2019. Harry Winston Jerome, OC, track and field athlete, consultant, teacher (born 30 September 1940 in Prince Albert, SK; died 7 December 1982 in Vancouver, BC). Three-time Olympian Harry Jerome won the bronze medal in the 100 m race at the 1964 Olympic Summer Games in Tokyo, Japan. He also won gold medals at the 1966 Commonwealth Games and the 1967 Pan American Games. Jerome broke the Canadian record in the 220-yard dash when he was only 18 years old and set or equalled world records in the 60-yard indoor dash, the 100-yard dash, the 100 m sprint and the 440-yard relay. Following his retirement from competition, he promoted amateur and youth sport through national and provincial programs. 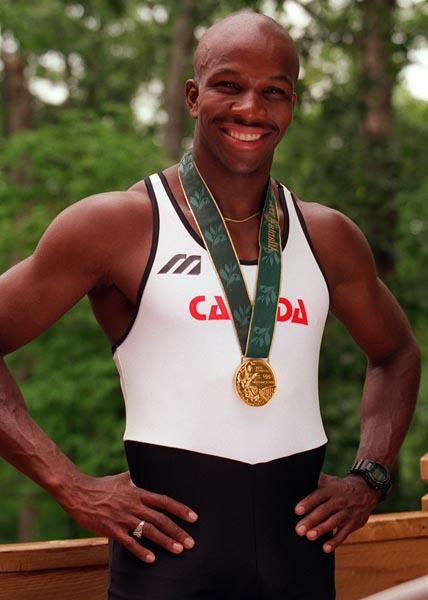 Jerome also advocated for better support of Canadian athletes and for greater representation of ethnic minorities on Canadian television and advertising. He was the recipient of numerous honours and awards, including the Order of Canada. 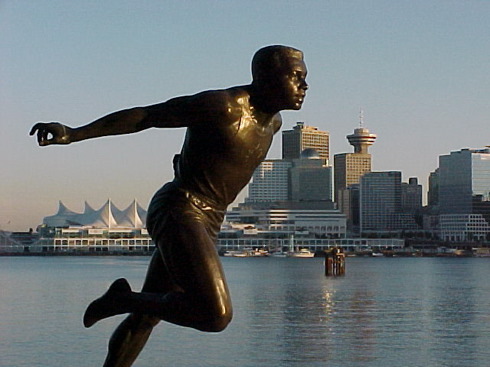 Statue of Harry Jerome in Stanley Park, Vancouver. Harry Jerome was born in Prince Albert, Saskatchewan, but soon moved to Winnipeg, where his father was a railway porter. He was the first of five children born to Elsie and Harry Jerome Sr.; sisters Carolyn, Louise and Valerie and brother Barton would soon follow. When he was 12, the family moved to North Vancouver, where locals tried to block the sale of the house. They were the only Black people in the community. Jerome and Armin Hary were considered favourites for the 100 m race at the 1960 Olympic Summer Games in Rome. However, at the games, Jerome was forced to pull up during the 100 m semifinals due to a hamstring injury. According to reports, he was so upset that he walked into the dressing room without saying a word to the press. Despite the public backlash, Jerome pressed on and in 1961 tied the world record in the 100-yard dash (9.3 seconds). In 1962, he equalled yet another world record, anchoring a University of Oregon relay team that ran the 4x110-yard race in 40.0 seconds. Jerome was therefore considered one of the top sprinters in the world when he headed to the 1962 Commonwealth Games in Perth, Australia. “Nobody should beat Harry Jerome in the 100 or 200 yards,” opined the Vancouver Sun on 9 November 1962. Just prior to the games, however, he developed a high fever and throat infection. In a repeat of the 1960 Olympic Games, Jerome was frustrated by injury, tearing the quadriceps tendon in his left leg. However, he didn’t at first realize what had happened, just that he had lost power. He was soon seen by two orthopaedic surgeons from Perth, who diagnosed a rupture of the rectus femoris muscle and recommended immediate surgery. Jerome opted to return to Canada for treatment. Yet again, he was criticized in the media. Australian newspapers like the Sydney Daily Mirror accused him of quitting, while the Vancouver Sun announced, “Jerome Folds Again.” However, it wasn’t long before C.H. Wayland, general manager of the Canadian team, set the record straight in an official statement. The Globe and Mail referenced Wayland’s statement in a sympathetic article, “Canadian Athletes Understand Misfortune of Harry Jerome,” the day the sprinter returned home. The article also informed readers that North Vancouver was holding a community-wide drive in appreciation of Jerome. Other journalists wrote in support of Jerome, as did fellow athletes such as teammate Bruce Kidd. But two questions still remained: would Jerome recover from this injury, and would he ever bring home a medal from international competition? Jerome’s injury was so severe that many people thought his competitive career was over. The sprinter himself, however, believed otherwise. On 29 November 1962, four days after the race, Dr. Hector Gillespie, a Vancouver orthopaedic surgeon and team doctor for the BC Lions, employed a new technique to reattach his quadriceps muscle to his knee. The Globe and Mail reported on 1 December that Jerome was in “satisfactory condition” following the operation and on 11 January 1963 that his cast had been removed and he expected to resume training in September. Jerome missed the 1963 racing season, but sheer determination and intensive physiotherapy saw him back on the track the following year. On 28 February 1964, he ran the 60-yard dash in six seconds at an indoor meet in Portland, Oregon, equalling the world record. It was a remarkable comeback. Canada's Harry Jerome (right) celebrates his bronze medal win in the 100m athletics event at the 1964 Olympic Summer Games in Tokyo, Japan. 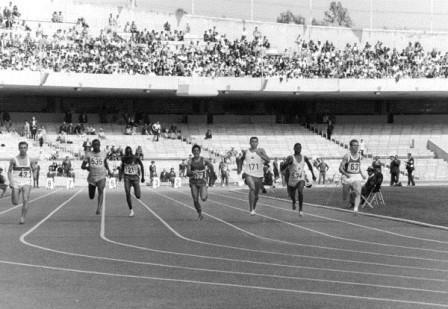 Canada's Harry Jerome (#171) competing in an athletics event at the 1964 Olympic Summer Games in Tokyo, Japan. 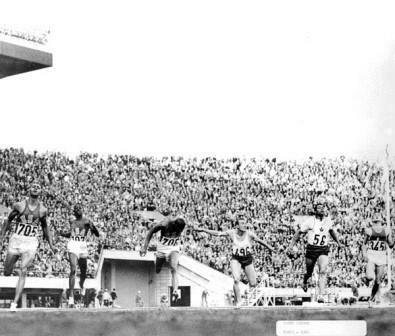 Canada's Harry Jerome (#56) competing in an athletics event at the 1964 Olympic Summer Games in Tokyo, Japan. 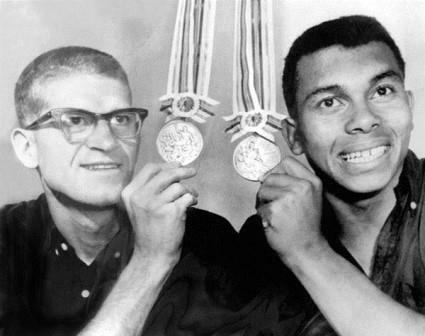 Canada's Bill Crothers (silver in the 800m) and Harry Jerome (bronze in the 100m) show off their medals at the 1964 Tokyo Olympics. At the 1964 Olympic Summer Games in Tokyo, Japan, Jerome won bronze in the 100 m race, proving his detractors wrong. In the 200 m event, he just missed the podium, finishing fourth. “Canada’s Finest Day at Tokyo Brings Gold, Bronze Medals,” announced the Globe and Mail’s Jack Sullivan. Canada enjoyed its finest day at the Olympics Thursday in many long years, crowned by a smashing triumph in the coxless pairs rowing event [by George Hungerford and Roger Jackson]…. Sprinter Harry Jerome of Vancouver, a disappointment at the 1960 Rome Olympics and the 1962 British Empire Games in Perth, Australia, finished a strong third in the blue-ribbon 100 metres to take the bronze medal. “I was determined to win something this time,” a happy Jerome told reporters afterward. … Jerome’s third-place finish was the best Canadian performance in the 100 metres since Percy Williams won the gold medal in 1928.… Bob Hayes of the United States tied the world record of 10 seconds flat in winning the 100 metres. Silver medallist Enrique Figuerola of Cuba was timed in 10.2, as was Jerome, whom he beat by a mere eyelash. 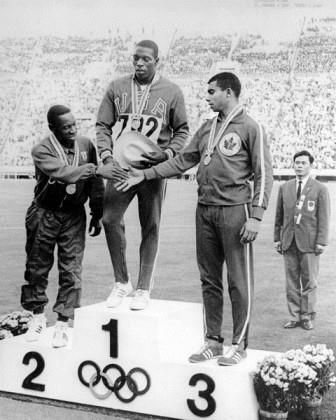 Jerome again reached the top of the podium at the 1967 Pan-American Games in Winnipeg, winning gold in the 100 m race. At the 1968 Olympic Summer Games in Mexico — the third Games of his career — he made it to the finals but finished seventh. He retired from international competition not long after. His last race was in 1969 at the Canadian national championships, where he beat the country’s best sprinters at the age of 29. Valerie Jerome, Harry’s sister, was also an accomplished track and field athlete. In 1959, when she was only 15 years old, she set the Canadian women’s record in the 100 metres (11.8 seconds). She competed at the 1959 Pan American Games, the 1960 Olympic Games and the 1966 Commonwealth Games. In June 1962, Jerome married Wendy Carole Foster of Edmonton, whom he had met at the University of Oregon. Daughter Deborah Catherine was born in January 1963, while her father was recovering from surgery. However, as an interracial couple, the Jeromes faced resistance and discrimination in Oregon, which put considerable strain on the relationship. They separated in 1966 and divorced in 1971. Wendy Jerome became a professor of sports psychology at Laurentian University. Jerome received his Bachelor of Science in physical education from the University of Oregon in 1964 and began teaching in British Columbia, first with the Richmond School Board (1964–65) and then with the Vancouver School Board (1965–68). In 1968, he received a Master of Science in physical education from the University of Oregon. The same year, Jerome was appointed to the National Fitness and Amateur Sport Program. He designed a series of sport instruction manuals and in 1969 led a “Sports Demonstration Tour” to high schools across Canada. In 1975, he returned to British Columbia, where he developed the Premier’s Sports Awards program. Jerome was an important advocate for athletes, demanding better financial support, coaching and medical attention. He also became an increasingly vocal advocate for minorities. In 1979, for example, he petitioned the Canadian Radio-Television and Telecommunications Commission for better representation of minorities in broadcasting. Similarly, he lobbied department store chains Woodward’s, Eaton’s and the Hudson’s Bay Company to use non-white models in their advertisements. Jerome died in 1982 as the result of a seizure at only 42 years of age. He is buried at Mountainview Cemetery in North Vancouver. Black History Month: Valerie JeromeA brief profile of Canadian athlete and educator Valerie Jerome. From writer Eve Lazarus’ website. Harry Winston JeromeSee highlights of Harry Jerome's stellar athletic career.